pack down time less than 5 minutes. Instant pop up tents are doing very well in the market for casual weekend camping. With the new hype there is an increase in improved design and higher quality products for more affordable prices. The Candora 4-6 person Pop-Up Family tent is a fine example of this. When comparing this tent to other more cheaply made varieties is becomes evident that this tent is great value for money. When purchasing a brand new tent it is important to know how many people need to stay within it comfortably. Once you have figured that out, double the number and multiply it by $100. In this example a tent for 4-6 should never cost more that $400-$600. If the cost is over there would want to be a very significant reason, such as a tent designed to meet specific challenges like Arctic temperatures and winds. Recreational camping tents should always cost less than what was specified. Any cost exceeding these criteria are penalized and loose points in this section. When researching a new tent, check to see what material the tent is made of. Ensure the thread count is above 100 and that there is also an applied water resistant coating. Secondly ensure the tents base tarp is of a higher thicker quality as this will prevent punctures and tears. It is always recommended purchasing a separate ground tarp to further protect your tents floor. The Candora 4-6 person Pop-Up Family tent main body is made of 190t polyester which also has a polyurethane water resistant coating. Polyester is a natural water resistant fabric and the added PU coating ensures no water can seep through small gapes between the materials thread. A downside to polyester is that it performs poorly for ventilation and insulation purposes. On a plus side polyester tents are easy to repair is there get any holes and if they get a small tear the material is designed in a way to prevent further tearing to allow time for you to make such repairs. As one would expect the lower the price the less feature. This isn’t always the case and this tent is a fine example. 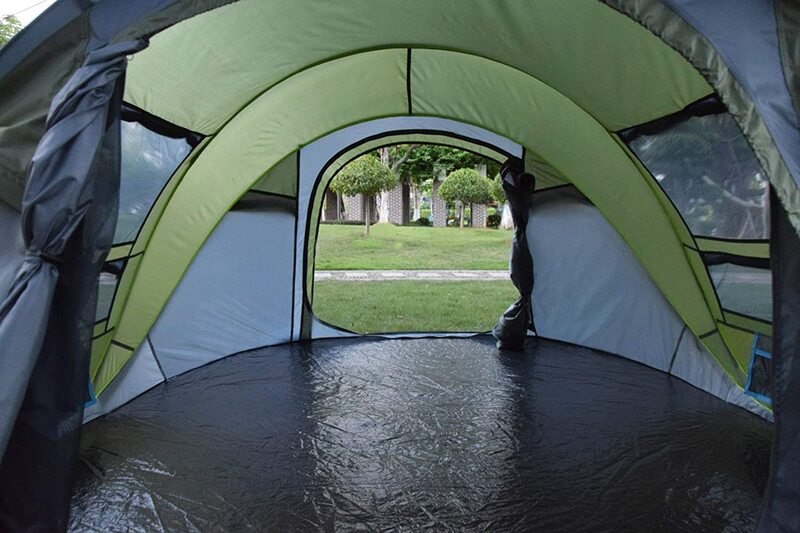 For its affordable price the tent comes with a surprising amount of features. Camping with a view is always a pleasure and that is more than realistic with this item as it comes with 4 windows and two doorways. Having two doorways is personally my favorite feature as it allows you to se up the tent in a way that maximizes ventilation. Secondly one of the doors can act as an emergency exit should the need arise. All together having 4 windows and two doorways allows you to customize the flow of air as you please. All the windows and doors come with fly screen mesh which allows you to keep your ventilation at maximum while also maintaining protection from pesky insects. The doors and windows also come with separate exterior flaps and doors to allow protection wind and rain. Don’t worry about being cooped up in an enclosed tent during poor weather as the tent also comes with vents, also thanks to the optimizable windows and doors you should be able to open crack open a window in the direction away from the poor weather. Unfortunately the tent does not come with a vestibule, however this shouldn’t be an issue as the tent has a both a separate luggage areas and storage pockets for your valuables. This is essentially better than a vestibule as it ensure weather protection for everything including your shoes. Just make sure to brush off your footwear as dragging excess dirt or stones is never good for your tents floor. Durability is a key variable to consider when purchasing a new tent. Everyone wants value for money, and nothing says value for money more than that item lasting a long time and performing consistently. The Candora 4-6 person Pop-Up Family tent Scored very well for durability. A tents frame work is just as important as the material surrounding it. after all you want it to remain pitched to protect you from the elements. This comes with an internally sewn fiberglass flex pole system. This system allows for the instant pop up assembly of the tents but is also its secret for durability. The poles are designed to be flexible but to also withstand constant stress under tension. This flexibility under tension is what holds up your tent but also provides enough flexibility and movement to assist with rolling off gusts of wind. The poles are also protected from internal or external chips and damages by being internally sewn. Being protected by the rents material means the tents poles are never separated from their joints. The general wear and tear on tent pegs during erection and pack up can result in chipped ends or even slits down the fiberglass poles, essentially rendering them useless. Grommets are imperative to allow pegs or guylines to safely pass through the tents material without damage. 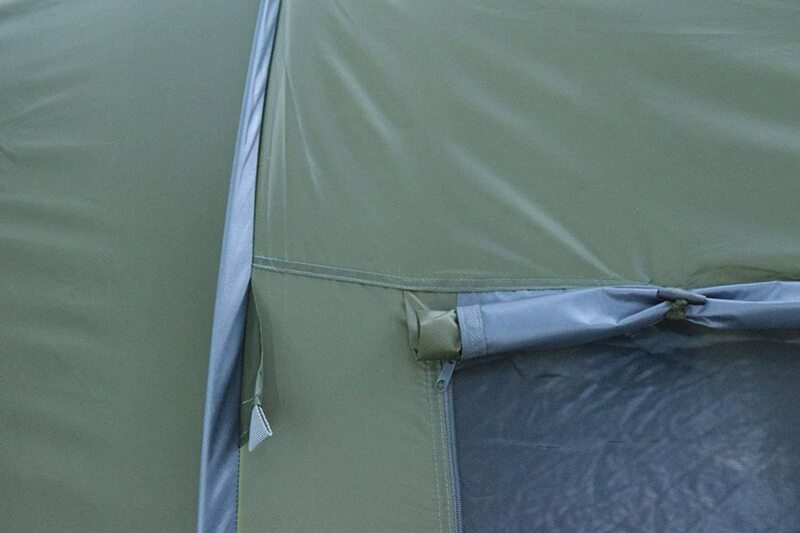 This tents grommets are a more common but equally clever in design. The grommets are simply a separate tether of material reinforced and sewn into the seam of the tent material. This method allows for extra stress whilst limiting chances of damage to the tents material. Sewing methods and sewn designs are also important to consider in a tents design. You want to look for double sewn 4 layer seams as they are the strongest and most durable. I am pleased to say that this tent does have these methods of sewn seams but it also has the bonus of the seams being sewn into separate reinforced stripes of material. There are plenty of zips of these tents with all of its windows and doors. All of those zips need to be reliable and ready to perform. This tent has achieved this my using nylon coil zip lines with metal zippers. Coil zips are know to be reliable. Secondly these zips are also sewn to the tents body with material reinforcement to ensure the zips can handle the stress load once the tent material is erect and under tension. Thirdly all the interior zips have a flap seal covering the zips essentially protecting them from frost, rust, dirt and moisture. It the case of an emergency it is important that zips work fast and efficiently without fail. I believe this tents design has achieved that. While you are on your adventures enjoying the great outdoors you seldom think of your resting space, but when it comes to finally rest and settle down space and ability to move around all your belongings and sleeping bag is pretty important. 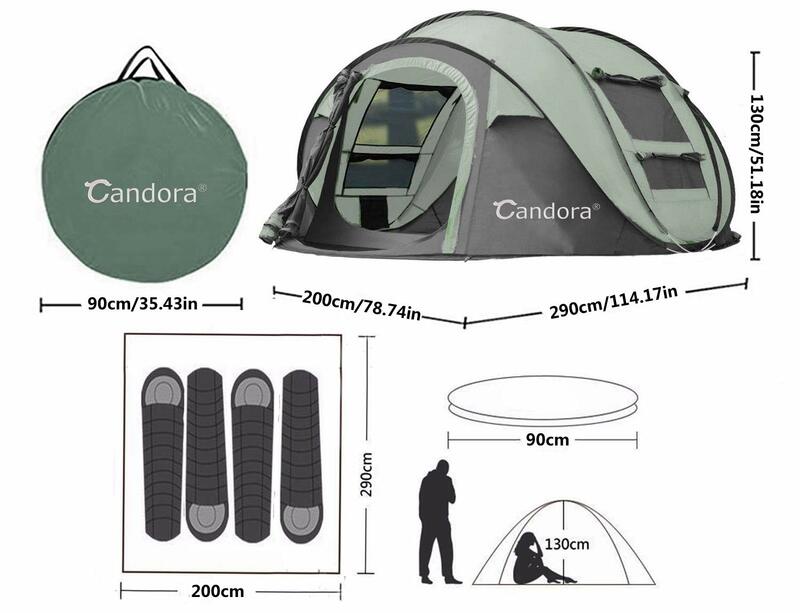 The advertised size for the Candora 4-6 person Pop-Up Family tent suggests 4-6 people. Please keep in mind that this usually means 4-6camping bags and nothing more. I would suggest that this tent is more suitable for 2-3 people with room for belongings and a clear walkway towards both exits. The dimensions below suggest a spacious comfortable camping space with room to sit and crawl in central areas. The tent is not tall enough to stand in. When considering the manoevrability of a new tent you must know what terrain and distance you will be traveling to for your camp site. The distance and terrain will determine what weight and package size of camping gear is practice and safe to carry from your method of transport and destined camping zone. If it is too heavy or awkward it can be a risk of injury and overall a loss in enjoyment for your adventures. If you are hiking of foot large distances to or between camp sites, ensure your tents package is both lightweight and easy to carry. If the package is too heavy or impractically shaped, the tent is more appropriate for uses where the walking distance is a short walk from the car. The Candora 4-6 person Pop-Up Family tent scored perfect marks for maneuverability. Though this tent is incredible light and easy to carry it is the shape that if fold down into that prevents it from being a suitable hiking tent. To be fair it is advertised as a family tent and so it has scored full points within that context. Whether you are camping in Australia, America or elsewhere, the seasons and the weather it brings is what you are up against and what your tent need to protect you from. You must know what temperature range you expect to be camping in to remain both safe and comfortable. As this tent is made of polyester it is unfortunately a poor insulator. It is because of this that the tent is only suitable for warmer finer weather. Though the tent does not come with any extra insulation features installed, the issue of ensuring a safe and comfortable sleep is easily solved. First it is recommended purchasing a sleeping bag suitable for the temperatures expected during the night at your chosen camping site. Secondly it is very wise to pack and wear temperature appropriate clothing. No matter the tent, if you have these two points covered you will always have a wonderful snug sleep in relation to temperature. Unless you are planning on camping in the arctic, one usually doesn’t plan to camp in strong winds or storms. With the wind in mind it is rather important to ensure that your tent can withstand a good amount of wind should the weather unexpectedly turn for the worst. There are a number of features that camping tent manufacturers used to provide such protection. 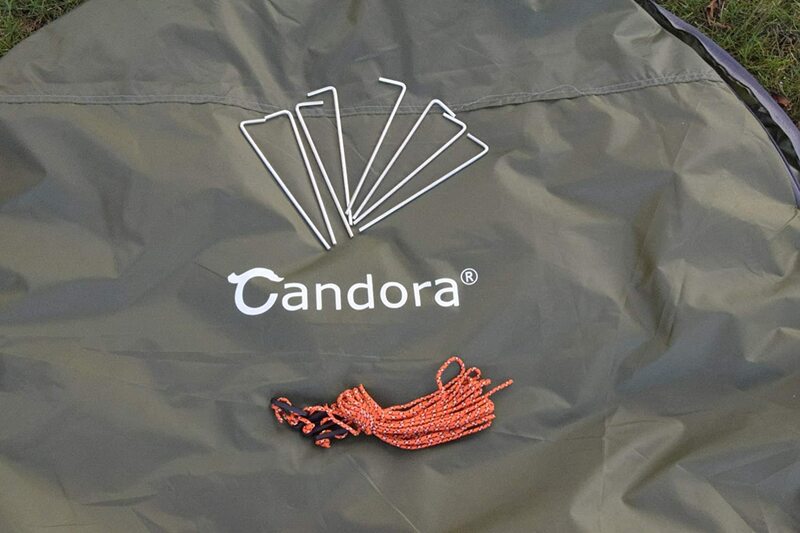 The Candora 4-6 person Pop-Up Family tent Scored very well for wind stability and resistance. This was achieved firstly by its dome like design. Dome designs being or a spherical nature allow wind to roll off and around the tent rather than it take the full brunt of the wind, which places extra stress upon your tents pole frame. Secondly these tents frame is a flexible fiberglass system the is constantly under tension. These poles are tough and can withstand a bit of blowing about by allowing movement of the poles but also maintain the tension that hold up the tents material. It is this movement in combination with the dome shaped design the efficiently allow wind gusts to move around and over the tent. But don’t worry, the tent doesn’t move around too much as there are a number of guylines to help maintain the tents stability. Finally, to prevent the whole tent flying away are 8 peg points and pegs which keep your tent fixed and secured to the ground. Overall its quite a well-designed system that works very efficiently. As you can imagine water resistance is something you want included in a tent. You want to keep yourself and your belongings nice and dry. As mentioned earlier this tent is made out of polyester. Polyester is a natural water resistant material. To further this water resistance the material has had a polyurethane coated added to further provide water proofing. This is achieved by the PU coating completely covering the material and all of it its small holes in between its thread. Unfortunately verified customer reviews have suggested that this tent is not as water resistant as claimed. This is because the tents seams are not tapes or sealed. So while the tents material is water resistant, water can still seep through the tents seams. This is not a good issue as not only can water enter your tent, but a build up of moisture in your tents seams and stitching can result in mold and rot, weakening the seams and damaging your tent. But do not worry, this issue can be resolved by simply applying your own tent seam sealant or tape. This is a common practice among camping enthusiast, as they wish to proved themselves further weather protection. The Tents ground sheet is a heavy-duty waterproof tarp like material. This material will keep water building up on underneath your tent from entering through. Assuming you have good camping practices and have set your tent up on a separate ground sheet, the chances of a rock penetrating this ground sheet are slim. If you do not set t up on a separate ground sheet you risk small sharp objects on the ground piercing your tents base and essentially undoing its ability to keep out water. Unfortunately these tents floor tart is stitched to the tents main body at ground level rather than higher up the tent body. What this means is that you need to be aware of where you set up your tent. During heavy rain water can run and build up against your tent and possible enter. This issue can again be avoided by ensuring the seams are sealed or taped. This product comes with a product warrant from Amazon. this tent is rather good quality for its price. If the weather turns for the worst and you have only just arrived at your camping destination than a quick set up time is going to be appreciated. With the Candora 4-6 person Pop-Up Family tent, set up time doesn’t really come much quicker. Thanks o the tents internal frame constantly under tension, it acts as a spring when released and instantly pops the tent up into shape. All that is left is to simply peg down the tent and set up the guylines. Pack-up is basically the same, simply unto the guylines and remove the tent pegs and fold the tent back into its folded down shape. Both process take less than 5 minutes with practice and is simply a real pleasure and convenience. We are a participant in the Amazon services LLC associates program, an affiliate advertising program designed to provide a means for is to earn fees by linking to Amazon.com and affiliated sites.